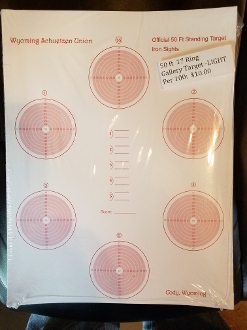 Our Products >> Gallery Target Light Bulls-50-foot/17-ring WSU-"German Ring"
Gallery Target Light Bulls, Approved for International Winter League 22 Postal Match. 17-Ring Gallery Target. All targets have LIGHT red bulls (iron sight). See also "DARK" bull targets. Gallery Target Light Bulls-50-foot/17-ring WSU-"German Ring"